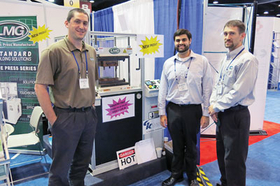 From left, Paul Check, Rob Boland and Phil Gouin show off LMG's new standard press that debuted at the Rubber Expo. NASHVILLE, Tenn.—After spending its history as a producer of custom presses, the LMG Division of Trinks Inc. unveiled a line of two standard presses during the ACS Rubber Division's International Elastomer Conference and Rubber Expo. The De Pere, Wis.-based firm exhibited both its Value Press Series and its Edge and Edge Pro brand line at the expo, held Oct. 14-16 in Nashville, Tenn.
“We've recognized the need for faster turnaround and more cost-effective solutions for our customers,” said Paul Check, chief engineer and general manager of LMG. The machinery maker originally was part of C.A. Lawton Co., operating under the Lawton Machinery Group name. C.A. Lawton sold the machinery division in 2007 to a customer who owned Trinks, and the unit is now marketed under the LMG moniker. LMG traditionally has been a custom press maker and currently focuses on compression, transfer and vacuum presses. But it spent significant time developing the standard lines to meet needs that LMG saw in the marketplace, said Check, who discussed the new machines at the expo. This line is strictly for compression molding for both rubber and composites parts. To supplement the machine, LMG makes a line of plasticators so composite materials can be melted and prepped into a slug that can be loaded into the mold. The Edge and Edge Pro presses are more flexible, Check said, with clamping ranges from 5 to 250 tons. There is an option to add a transfer cylinder so it can be used for either compression or transfer molding. LMG gives more options on these machines, including processing multiple profiles and recipes. Customers also can do data collection, real-time graphing, link the machine into its network connection and write data files, among other tasks. Check said the Edge can be used to produce a broad range of end products, from rubber gaskets and plastic handles to check valves, medical parts and implantables. LMG for the first time also is enabling customers to order the machines online, at www.lmgpresses.com. Check said the firm set up a tool on its website so if customers know exactly what they want to order, or want to repeat a prior order, it can be done online. “It's another way to get product in the hands of customers faster,” he said. The press maker offers 10-week lead times on the value presses, 12 weeks on the Edge compression offerings and 13-14 weeks for an Edge press with transfer setup, according to Check.